Make an Immediate Impact on Your Bottom Line by Heading off Labor Over-runs Before They Get Out of Hand. Use the results to refine your estimates for future jobs. 1. The first section of Illustration 1 shows three different levels of employees. You’ll see both Gross Pay per Hour (in yellow) and $ Including Taxes and Other Burden (in blue) for each. You’ll notice that the fully burdened (your TRUE) costs of $1,809.67 are significantly higher than the gross payroll costs of $1,063. WHAT THIS MEANS: Unless you’re seeing fully burdened costs per hour in your job-costing, you are NOT seeing the true costs of your labor. 3. The third section shows an example of results where the crew completes the job within the estimated 49 hours. BUT, the section highlighted by the yellow box shows that the actual hours worked by different employees was different than estimated. You’ll also notice that the average cost per hour changed from $36.93 per hour to $38.13 per hour (aqua-colored arrow and box). This “time shift” creates a cost overage of $58.49 (3.2% above the estimate). 4. In the top section of Illustration 2, we’re still at 49 hours, but to continue with the point made in #3 above, I’ve shifted the hours again. You’ll see the average hourly rate has gone up from $38.13 to $38.59 and our difference from estimated is $81.05 (see the olive green row). 5. BUT THERE’S A PROBLEM. Even though we’ve worked the estimated 49 hours on this portion of the job, it isn’t done. Our supervisor lets us know that he estimates that we’re only about 85% of the way through. So I’ve added another 8.65 hours in the same proportion of costs to date. The result? It looks like we’re going to be $414.71 (22.9%) over budget! WHAT THIS MEANS: Labor costs can spin out of control very quickly! The green notes and highlight show what you’d see in the “interim” report, and the aqua notes and highlight show what you’d see after all costs have been entered at the conclusion of the job. NOTE: Of course the notes and colors wouldn’t be shown in a standard report and, to keep the illustration a manageable size, I’ve excluded other job stages and income columns that you’d normally find in an Estimated vs. Actual Job Cost Report. 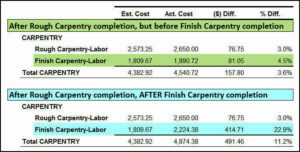 Know and use your true, fully burdened labor costs when estimating. 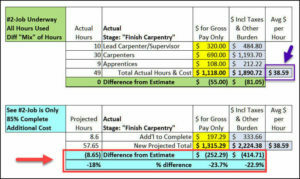 Increase estimating accuracy by using costs based on specific employees (or averages based on employee levels). Monitor what level of employee is working on various aspects of the job. 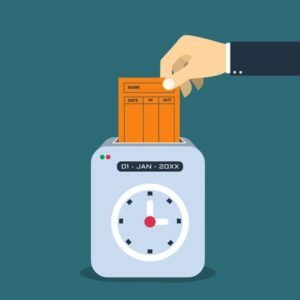 Continually monitor time and cost progress against estimates. If a job-stage is taking longer than estimated, try to find out why, and see if the problem can be addressed as quickly as possible. Use what you learn to improve internal processes. 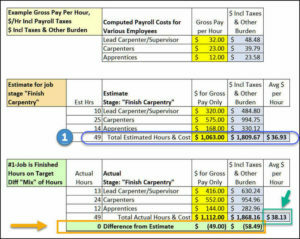 Use job-cost reports to refine your estimates for future jobs.